Is there anything that Jayson Tatum can't do? It's not just that he is dunking over any and all opponents. It's how he is doing it. He has the ability to get through a crowd with his ball handling, avoiding all of them and then jamming the ball over whoever is left. The defenders can't play him only for the drive to the hoop because of his outside, and inside, shooting ability. He is deft with either hand. "I think Terry [Rozier] and Marcus [Smart] are really ready to step up," Ainge said. "And Jayson and Jaylen we can be a little bit more patient with, but they are going to play an important role." "We'll see what minutes [Tatum] will earn. I'm not worried about how they will play when the lights go on. It will be unlikely that Jayson is Rookie of the Year because it will probably come from a team that starts their rookies and plays them 35 minutes per night." Well, guess what! 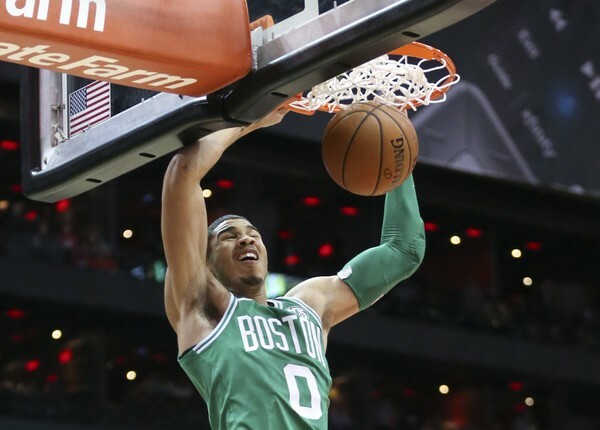 Tatum is starting and playing almost 30 (29.8) MPG. He is averaging 13.9 PPG, 5.6 RPG, .82 BPG (leads team), 1.0 SPG, all the while only turning the ball over 1.6 times per contest. But back to the dunking. Most NBA players can jam the ball when no one is hanging on them. I was lucky to come across the video below by Sport Science. It is funny and instructive. It shows Jayson dunking while wearing 65 pounds of armor. That is adding almost 1/3 to his weight. My clients and I will do exercises wearing a 40-lb weight vest. It feels double that. Trust me, the video is impressive. Many basketball writers feel Jayson is playing like a five-year veteran. He is, and that is scary. What is he capable of? We are going to find out, and it is exciting.